focus on the "small things"
not worry when things aren't "perfect"
always remember what this time of year really is about. I wish the same for you, friend! Happy Holidays to you and your lovely family. and love for the next year! I will certainly do all of these. Thanks for the reminder Andrea. This is just what I needed! Especially the part about remembering what this time of year is really about. Sometimes that can get lost in such a materialistic society. Happy holidays, and we'll "see you next year"! Happy holidays and best wishes in the upcoming new year! And happy holidays to you as well! Enjoy. Dear Andrea, I wish you all the same. Thank you for being my blogger and Dailymile friend this year. Look forward to another year of reading your blog. I hope you enjoy this time with family and friends! What a great idea to unplug a bit through the holidays! Wishing you and your boys a very happy holiday season and new year :) Cheers! Thanks for all your well wishes Andrea - I've appreciated it! I hope you and your family have a wonderful holiday season! Hugs to you! LOVE. LOVE. LOVE that! I most certainly needed that reminder, Andrea! What a beautiful reminder Andrea! I too was thinking of taking a break and going off the grid for a couple of weeks. I feel like my my mind and body need a rest. Happy Holidays to you and your family. May enjoy many blessed moments and your heart be filled with joy. Happy Holidays! Hope you have a great time celebrating with your family. Lovely Andrea! Hope to he joining you in relaxing soon :-) Have a wonderful time this holiday season with your family! Beautiful post! Happy holidays to you and yours, Andrea - I hope to read more of your posts next year! Andrea, you must just be having too much fun during the holidays...hope to see an update of your wonderful times! Sometimes I think I should unplug too, but uh...I haven't had the guts for that yet. Merry Christmas, dear Andrea, to you and your family. And Happy New Year! 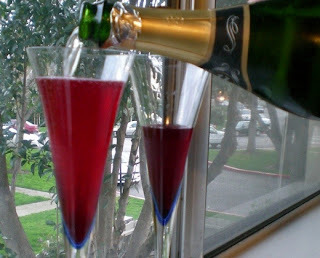 I'm so going to go buy some bubbly tomorrow and just sit down relax and enjoy some good times with the people i love. Thanks for putting it that way and giving me perspective this season. Happy Holidays! Sorry to be late to the posting party Andrea. Hope you and your family have a WONDERFUL holiday season. I look forward to your posts in 2012. Happy holidays, may the new year be filled with blessings and joy. I hope you had a great holiday season Andrea! I hope your family and you had a wonderful holiday.